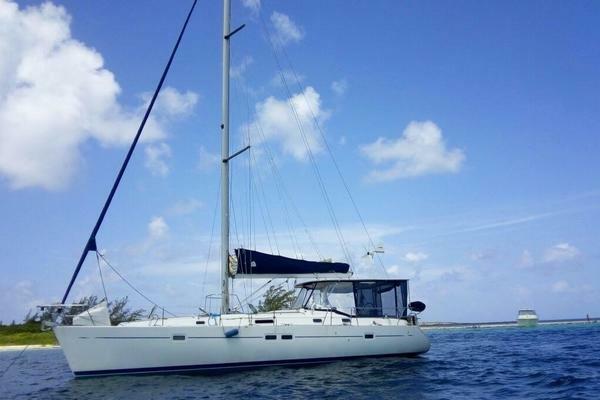 Caliber 40’ LRC 1996 is the perfect cruising sailboat. All New Garmin Electronics, New A/C, New Batteries and Wind Generator. This is the nicest, most up-to-date Caliber 40’ LRC on the market. This boat is priced to sell and the owner is motivated. United Yacht Sales New Jersey would love to guide you through a personal showing of this 40' Caliber 40 Lrc 1996. This yacht for sale is located in Palmetto, Florida and priced at $149,000. For a showing please contact us by filling out the form on this page and we will get back to you shortly! This vessel is 40’ but has all the space and tankage of a much larger vessel. 210 gallons of fuel capacity as well as 165 gallons of water capacity. The head room in the salon makes the volume of the interior seem greater than a 40’ boat. With a finished teak and holly floor and teak interior throughout the boat. This Caliber 40 LRC is a dream vessel from the forward master stateroom all the way to the spacious aft head and stateroom. The Main Salon has seating for eight and a fold down dining table. The port side of the salon seating area can be made into a sleeping are for guests. There is storage throughout the salon area and the salon has very nice cushions. The Galley has a refrigerator, freezer, microwave, stove top, oven and double sink set up. There is cabinets in the galley that will hold plenty of supplies. Counter space is large enough to spread out and cook a large meal for family and friends. Master stateroom is a very large private room with its own private head and shower. There is storage under the bed and enough cabinets and hanging to store close and supplies to last you a full cruising season. The guest stateroom is large enough for a couple to sleep comfortably and has a head and shower right outside of the stateroom. There is storage under the bed and a hanging closet with room to spare. The Deck has molded non-skid and and a nice gelcoat finish. There is a bow pulpit with room for two anchors and a windlass to retrieve the anchors. The cockpit is covered by a full bimini and eisenglass cover with padded seating for the cockpit. There is stainless lines around the deck and stainless railings around the cockpit. The vessel Water Music (40’ Caliber LRC 1996) sustained a lightning strike in 2017 and has had all effected equipment replaced. The replacement of the affected equipment took place throughout 2018. Effected equipment that was replaced is listed below. The electrical consists of a DC and AC system. The DC is run from the new Outback Energy Cell Batteries. The AC system is run from two 30 AMP shore power plugs or the inverter. Batteries are charged by the battery charger when the boat is plugged into shore power or from the engine while running the boat. There is also a New D-400 12v Wind Generator to charge while sailing or on the anchor. The electrical system has been gone through by a professional Boat Yard and is in complete working order. Great boat with all new electronics and best price on the market.